IJBM: I missed Cirno Day - It Just Bugs Me! I considered posting about it here, but didn't. oops. 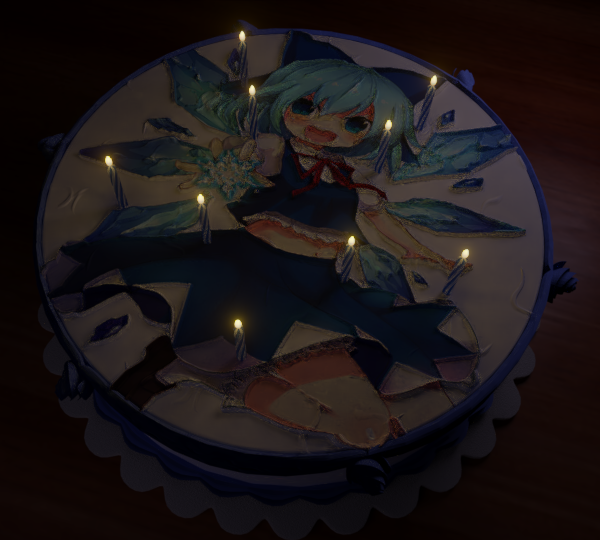 If it helps matters, Cirno Day is not what it used to be. You see a couple dozen congratulatory pictures and maybe a video or two, but that's it. Oh yeah, original Cirno picture by Karasusou Nano. How did you get it printed like that? I don't think that's a physical IRL cake...? TYL: you can fool GMH with a low-res, dimly-lit picture of a nonexistent cake. I thought the first one had reasonable enough resolution. The second one definitely did, tho. NOTE: read right to left. > If you had Cirno an equation with a 9 in one of the operands, will she write "NaN"? Or will her head explode? > Inquiring minds would like to know! If the "9" happens to be found in between two other digits, Cirno will remark that the problem has been miswritten. We partly discovered this when asking her to solve the problem 94 + 12 = ___; she said we did something funny with the setup, erased the "9" next to the 4, and placed it on the right-hand side of the 4... (the natural format by which an "x" would go next to a coefficient in an algebraic equation; we later saw that she was absolutely perplexed by setups with "9" in-between two digits, looking at us with eyes that are meant to be cast upon insane people). We then had her try to solve the equation she had setup: 49 + 12 = ___. She asked for us to fill in the other side of the equation for her after an awkward pause as she looked upon us with a face that said, "what exactly do you expect me to do with this?" 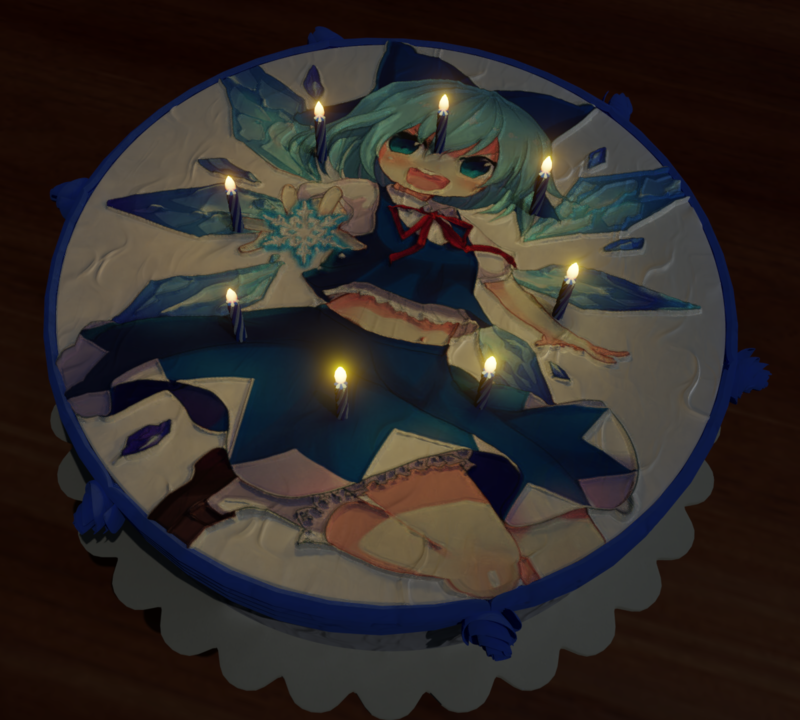 At this point, while we were mindful of the fact that Cirno worked in base 9, we felt the unfortunate need to remark to her that "forty-nine does not equal forty-eight", upon which Cirno looked at us and said in a surprisingly matter-of-fact tone, "of course it doesn't...but what does that have to do with this? ", leaving us flustered at our apparent stupidity for a moment as we watched her CONTINUE to work the problem: 9 = 48/4 = 12. At this point it became clear that the "9" was indeed being treated as a variable in the equation... and Cirno had performed a completely correct subtraction and division in base 9 to do it. The number would not register as having the same significance to Cirno as the rest of us with consideration of its value in the decimal system to represent a particular quantity. Rather, she'd assume, since the number "9" could technically count as a letter or a symbol of some sort, that "9" is a variable that she must solve for by algebraic or other means. This is my favorite interpretation of Cirno. I only recently found out about digital roots and I thought it was a load of trivia but apparently it is its own branch of number theory with handy applications. I still hate the name "digital root", though. It implies something opposed to analog and something involving fractional powers. Except it's just adding up the digits over and over again. I'd have called it "digit sum compression". If nothing else, that's where the 3, 7 and 11 divisilibity tricks come from. I had a harder time than I'd like to admit in demonstrating the 1,2,4,8,7,5 thing, although in the end I did. I've been toying with the idea of doing a master's in applied math, though I have to find out if it's as cool as it seems at a glance. I would buy that clock, even if the aforementioned error would drive me mad every day.